Catch an exclusive interview with Kenyan reggae artist HABIDA on the ALL AXE-S radio show this week. Hosted by Heike Demster, ALL AXE-S is a dance­hall reg­gae show on BigUpRadio.com fea­tur­ing spe­cial guests and all of the lat­est dance­hall sin­gles and riddims. 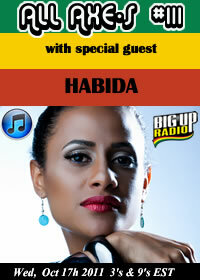 Find out all you need to know about the the upcoming reggae artist known as HABIDA. Tune in this Wednes­day, October 17th! Showtimes: 3am, 9am, 3pm & 9pm EST. Born in Nairobi, Kenya, Habida has taken the road less traveled to this point in her budding career. In her hometown, Habida was involved in a small community-acting troupe for a number of years, which further advanced her love for creativity and acting. She also found time to model for the internationally renowned African agency, Kiko Romeo. Thoughts of pursuing her dramatic studies grew, so much so, that in 1998 she made the choice to leave the comforts of her home and study drama abroad, in London, at Lewisham College. Habida’s love for three decades of soul (60-80s) tugged at her spirit. Soon, she found herself trading much needed sleep for extra time writing poetry (which later became the seeds to her self written songs) and taking her singing talent to another level. As one could surmise, she decided to dedicate her time to the written word as well as song compositions, recording a 6-song demo in the spring of 2003. Not one to be complacent, she searched for a way to couple and excel in her two loves, theatre and music. Now Habida is working on her album, which is due to be released before the end of 2012 that includes collaborations with several African artists, such as Nameless, Hussein Machozi, Nonini, Chidi Benz, and Canibal. Habida is also keen on diversifying her art which is also why she has and hopes to continue working with producers from different genres, an example of this is her collaboration with the US techno producer currently residing in Germany in 2011, Dan Curtin on several releases, some already released and others in the pipeline; Silvastone from the UK where she has recorded and released in June 2012 a hit track which has already topped the Kenyan charts called “Girls Night Out”. Efforts are also underway to work several renowned producers in the UK, Nigeria and South Africa, which will spear head her career into a world-class artist.